If you’ve arrived here, my guess is that you’re interesting in monkey puzzle trees. Welcome to Monkey Map. This project is the personal project of me, Sarah Horton. As of May 2016, my work here at Monkey Map is done. I live in Liverpool. For nearly the last three years I have made it my mission is to catalogue and map all known monkey puzzle trees. The Monkey Map has been created by me, and I have been helped by my task by keen monkey puzzle hunters who also do this in their free time. It is a work of personal passion and has brought me great joy. However, after personally cataloguing nearly 4,000 monkey puzzle trees single handedly, I have now come to the conclusion that the work involved is simply too much for me to keep up, and my work on the Monkey Map is done. 1. First there is this website which is how the project began in October 2013. It began gradually, initially with trees I’d located, but I was soon being sent emails and details of other trees. I continue to write blog posts on this site, and write regular updates of progress and feature collections of monkey puzzle trees and the places they are found. In April 2014 I made the decision to start cataloguing trees using the letter of their postcode location, and a sequential number. I then set up the spreadsheet, to keep track of them. These individual ‘cards’ can be viewed singly, as above. Or they can be viewed as a full collection. They can also be sorted by their labels which are the postcode and the ‘Agent’. Agent status is given to monkey puzzle hunters who have shown particular dedication to the task of locating and photographing monkey puzzle trees. The Monkey Map has been supported by about 30 Agents, but also other people who contact me with details of trees they have found. Thank you everyone. The catalogue is HERE. (Please note only about the first 2,500 trees appear on the catalogue, as the work of including them all was too much). Agent Simon, based in the West Midlands. 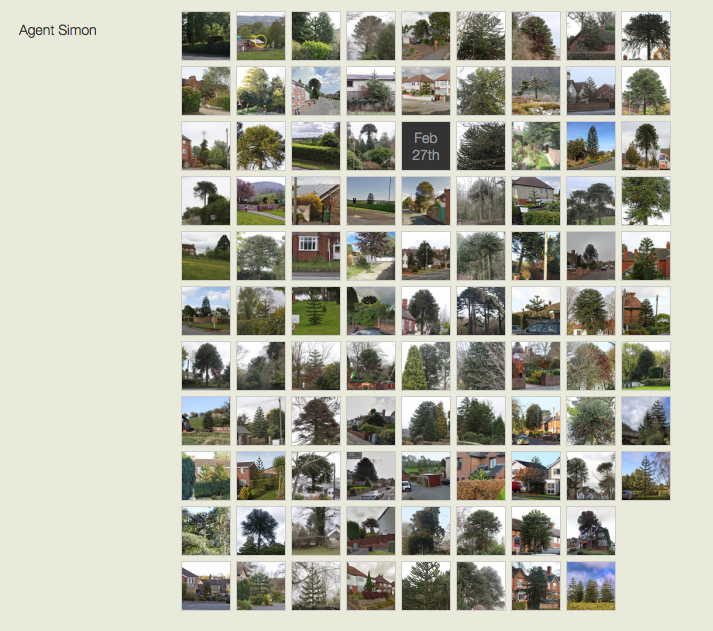 I initially set up this catalogue website simply as a way of keeping all the photographs of the trees filed in one place. I would then produce individual maps which I created in Photoshop and then Pages to show the locations of the maps, which was very time consuming. It was Agent Simon who then helped me create a Google map. 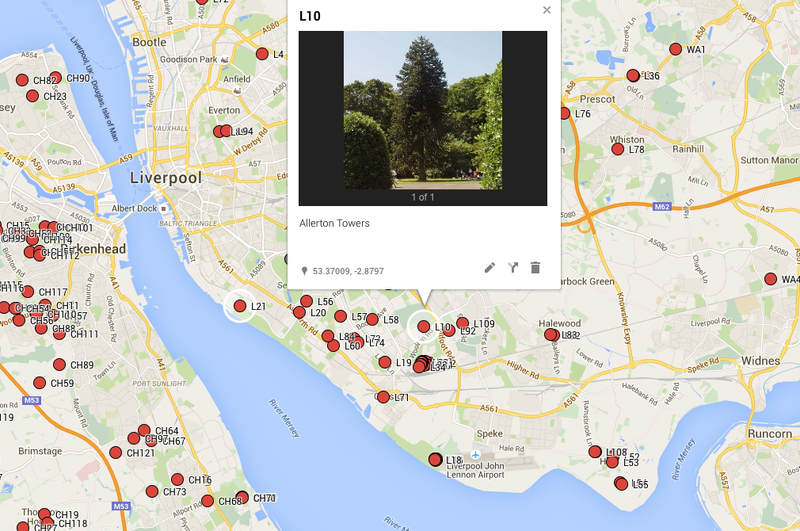 The Google map covers the whole world, although most of the trees in the catalogue are currently in the UK. The Google map is HERE. You can find a beautiful specimen on the corner of Longhaugh Road and Fintry Terrace Dundee. I’m 47 now and remember it as a child. I’ve traced a picture via zoopla for it and hope it helps with your Scottish Catalogue. Thanks Joyce, was able to find this tree and will add it to the DD catalogue – and was sent a lovely image by a contributor to the blog who is in that area. My neighbour has a monkey puzzle. Not a huge specimen but it’s doing well – rg22 4ez Ellington Drive in Basingstoke. There is also a stunning specimen on the A30 In east Hook Hampshire. Thanks Michael – I have found the RG tree. Perhaps you could send more accurate location of the A30 tree, I can’t find it on Google, thanks. I have a small one in my back garden I love it and there’s a huge tree round the corner from me so. Liverpool rd North Maghull. Glad to hear you have a much loved tree – perhaps you’d like to send a photo for the catalogue? 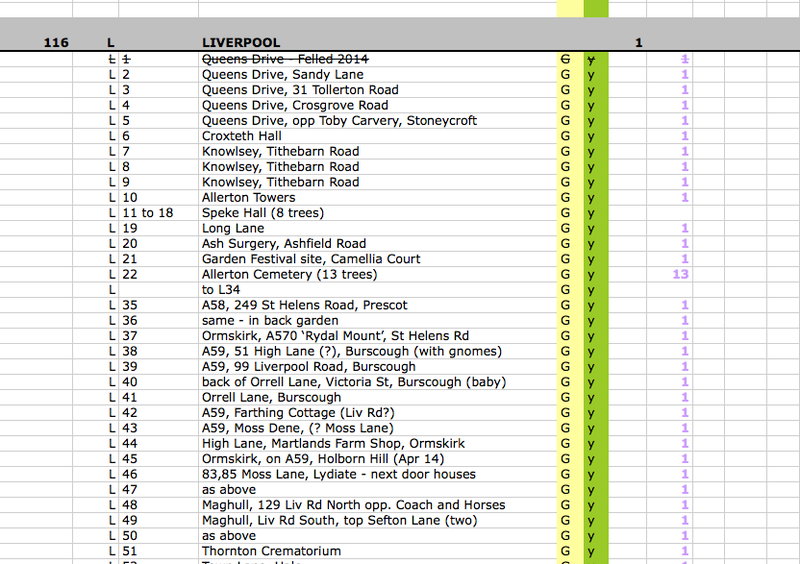 And yes I have the Liverpool Road North tree on the Monkey Map, catalogued as L48. There are two in Haig Avenue in Southport, in 2 gardens quite close together, just along from the football ground. I drive down there often, but only noticed them when on foot a few weeks ago. It shows what we miss when behind the wheel of a car! If you don’t really fancy a jaunt to Southport FC (& who would?!) I can try to get pics for you on my phone. Always happy to receive additional and updated photos. Thanks very much. Came across this site whilst looking at some MPT facts online, what a great idea this is. We have a huge MPT in our front garden 43 Gibbs Road NP19 8AR. I don’t think you have this in your catalogue and you’re quite welcome to include it. Thanks Andrew – yup that’s a new one, and a first for the AL postcode area. Thank you. Has anyone else seen the recently-planted avenue (roughly 40 trees ranging in height from 10 cm to 1 m) at Buscot Park, SN7 8BU? I have taken some photos of the trees, but is there any way, please, of emailing images rather than displaying them on one’s own website? Hello – not had those trees reported here, would be glad to add them to the catalogue. I’ll drop you an email. Thanks. There used to be one at North Devon District Hospital. I used to help run the grounds maintenance contract there. If you contact Paul Humphries at the hospital he will be able to give you details. He was the person responsible for it being planted. Hope you find it. Thank you Philippa – can’t see it on Google, so I’ve written to the hospital. I’ll include in the next roundup and someone may read about it and be able to send a photo. Thanks. I found another on Sunday, in the village of Great Eccleston near Garstang, in a garden on Chapel St. If you are ever in the area, the chippy on the main street is awesome, that’s why we were there! Thanks Sue, yes found that on Google. And always handy to know about a good chippy!! Hi, my great grandparents planted a monkey puzzle tree in the front garden of their house in Cathay Terrace in Cullen, AB56. I went to visit it in the summer. I have a photo I can send you. Hi Fiona – how nice that you know who planted the tree. Yes please do send me a photo, and their names if you wish. Thank you very much. I will send you my email address. Hi Sarah, there is one next to my allotment in Chapel Allerton Leeds. My postcode is LS17 6LS and the mpt is opposite about 100yds east and 30yds south. It is on Google maps. I was surprised to find no trees on your map for my neck of the woods – Haworth and the surrounding area of West Yorkshire. However, the popular Radio Leeds Sunday gardening spot have just given your site a mention and and put the link on their Facebook page…..you may be deluged with great new sightings!! Thanks Graham – nice to hear that the good people of Yorkshire are keeping their eyes peeled! Look forward to more trees from your area! Thank you Graham. What a fine pair of trees in the first link! I will add to the catalogue. Cheers, Sarah. There’s a large one or used to be in the right hand side of the new Bedford rd past stockingstone hill as you leave the town centre in Luton. I can’t confirm its still there as I no longer live there (sorry) but someone could maybe help? Thanks Lou – can’t find that on Google, but I’ll put a call out in the next round up and see if anyone there knows about it. Hi there’s a fair few at Biddulph Grange gardens, and there is one at Trentham Gardens, stoke. I will try and get some photos and clarify how many are at Biddulph. Hi Charis, thanks. I found 15 at Biddulph – featured here https://monkeypuzzletrees.wordpress.com/2015/02/21/biddulph-grange/ (with a map)….. there may be more? Do you have a photo of the Trentham Gardens tree, or is it visible on Google? Thanks. Thank you David. A nice start to the PO catalogue! Thanks. Thanks David – that’s great, three more for the PO postcode area. Many thanks. There’s a small monkey puzzle tree at the corner of Lisson Grove and Tavy Place, PL4. It’s at OS reference SX 48661 55820, or http://www.gridreferencefinder.com/os.php?x=248661&y=055820&lt=50.382746&lg=-4.1300279. You can see it on Google Earth. There’s a bigger tree in Ford Park Cemetery, Plymouth, at SX 47875 55914 but I don’t suppose that’s on Google Earth. Thanks Joe – I’ve found both those trees on Google and will add them to the catalogue. Thank you for your interest. There is a Monkey Puzzle tree behind The Langley Arms on Guest Ave, Emerson’s Green, Bristol which you should be able to view on Google. Thank you Charon, yes that is visible on Google. I will add to the catalogue. Hi Sarah – the 2 recent mentions of your Monkey Map on Radio Leeds can be found on the BBC iPlayer here http://www.bbc.co.uk/programmes/p037tlf7 at 01:18:42 into the gardening show and here http://www.bbc.co.uk/programmes/p037y9bv at 01:23:00 into the mid-morning show. Thanks Graham – nice to hear where all the Yorkshire interest came from! Look forward to more Keighley trees, and do let us know how you get on with growing your own. Hi Sarah – Thank you ever so much for putting Keighley on the map and for the most entertaining ‘Yuletide Greetings’ blog…..here was me thinking that seed harvesting and propagation could be a bit tricky – until I laughed out loud upon seeing the photo of the mass of Monkeys in the Belgian greenhouse when I realized it couldn’t be rocket science!!! There are details of 5 more Keighley Monkeys in the pipeline……..
Hi Sarah, we’ve just moved into a house in Holmfirth, West Yorkshire that has a pretty big example in the garden. HD9 1XF. Cheers Steve. Hi Steve – don’t have many round there, perhaps you’d like to send me a photo and I can catalogue it. Thank you. There is an old one you can see clearly on google maps on the A44 in Little Compton, it’s outside the old school. It would be simple to open the google map so that anyone can edit and add tree locations and pictures. But also remember to tick “Prevent editors from changing access and adding new people” so that you control the overall rights. Hello. There are several Monkey Puzzle trees in Molde, Norway. I have one myself. In our town there may be about 50-100 trees. Some huge specimens too (15-20 meters) When I walked around here I saw about 15 trees just in my neighborhood. It is a common tree at least right here along the western coast of Norway.